The Apostolic Chancellery houses the Church's main administrative offices and the University Chapel. The Chapel is dedicated to public worship to which the faithful have access. The University Chapel is used for observance of the Sabbath on Saturday, where Communion of Fellowship, consisting of bread and water, is held according to the order of communion prescribed in the liturgical books. The Chapel is also used for instruction in scripture, the delivering of sermons and the administering of traditional Christian rites. The present Chancellery building has housed the administrative offices of the Church and of the Jamilian University of the Ordained since 1979. 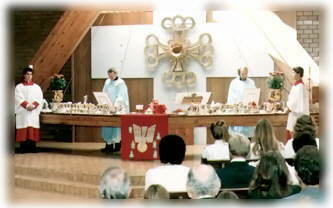 The University Chapel was added by Church volunteers in 1980. Public worship services have been held there since that time.